This gyaru was spotted far from her natural habitat. 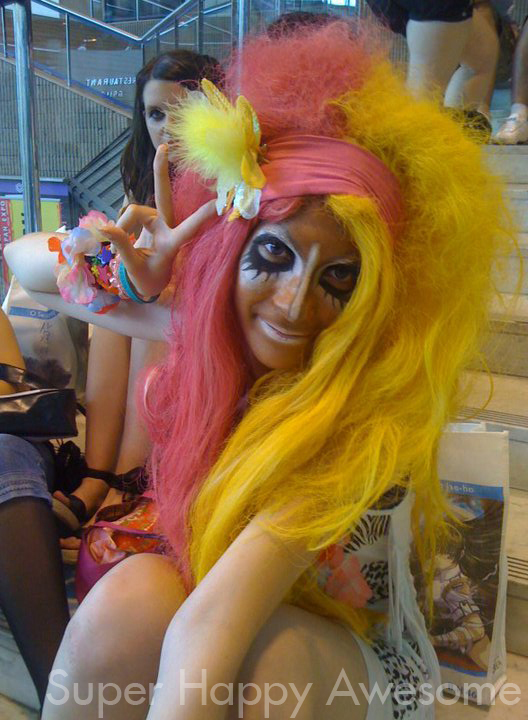 Could it be the rare Parisian Ganguro? Brilliant! It’s no secret that Ganguro and Yamamba are some of my absolute favorites of Japanese fashion subcultures. We were in Paris last summer for Japan Expo (best business trip ever? Being president of Otakorp Inc. did include some pretty awesome experiences!) and there I spotted this gorgeous Gyaru. What do you think? The style is pretty intense, and definitely not for everyone! It’s slightly terrifying, and I love it. How about you? If you’re interested in more Gaijin Gyaru, check out Tokyo Bounce’s post on the Gaijin Gyaru awards! This entry was posted in Adventure!, Photos!, you so crazy! and tagged conventions, fashion, france, ganguro, gyaru, Japan Expo, make up, mamba, Otakon, paris, travel, yamamba, yamanba. Bookmark the permalink. I honestly don’t see the appeal. I know it’s a statement, but…she looks like a clown. Hmm I just don’t think she pulls it off as well as the local girls. Gosh, you went to Japan Expo last year… And you survived without losing your sanity? I had to go to meet somebody (who was on the rare booth not dealing with otaku non-sense but real Japanese culture) and it was one of the scariest day of my life. Actually, I went to Paris a couple of days ago too, and I stumbled upon two French girls that would fit perfectly fine in Harajuku… Scary too (because this time they were in the streets going on about their day, not at Japan Expo where people will dress up for the occasion.